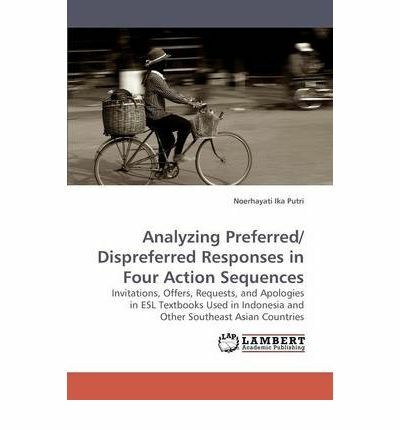 This study describes an analysis of 11 ESL/EFL textbooks used in Indonesia and broader Southeast Asian countries. The focus of the analysis is on a particular organization of talk-preferred and dispreferred responses- in four action sequences; invitations, offers, requests and apologies. Preferred and dispreferred responses involve turn-taking (distribution of talk across two participants) in adjacency pairs (Levinson, 1983). This study investigated the accuracy of the textbooks dialogues based on the characteristics of preferred and dispreferred responses described in Conversation Analysis (CA) literature. The results show that the textbooks have some problematic dialogues because of the incomplete preference structure and unclear situation or background information. Those textbooks also do not explain accurately what happens in the dialogues. Some parts of the dialogues (including the preference structure and the way the actions done) are left unexplained and this may cause confusion for the students.